I have 2 rabbits myself and I know when going on holiday, finding someone to look after them, someone that truly understands rabbits is very difficult. They are not rodents, they need fibre and lots of it they have special exotic requirements others may not be aware of. Hay, pellets, veggies, daily exercise, human contact etc. We have been running 5 years now. 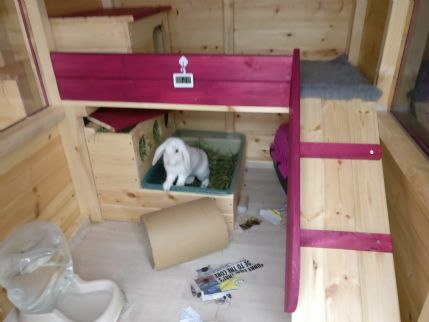 Located in the Tamworth UK area, professionally care for your rabbits in my home, in the largest possible accomodation, be it a 6 x 2.5ft pen to our largest 50sq feet outdoor cottages which comprise of a 6x4 shed and 4x4 attached pen. I know some rabbits get along and some do not. 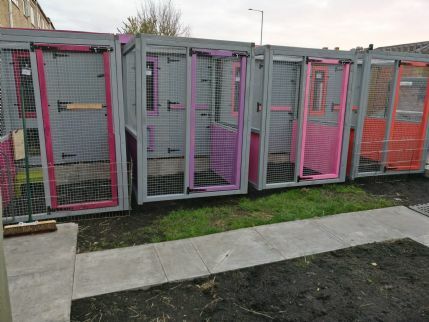 All guests are kept in separate housing with singles, bonded pairs and trios kept in secure pens to prevent any problems. My two are neutered and fully vaccinated so no unwanted surprises when you return but as I intend to keep all guests away from each other that shouldn't be a problem. I offer the THE biggest accommodation for the duration of their stay so they are happy and healthy and will get daily exercise, plenty of room to flop and eat. Please bring them in a pet carrier for their travel time. Please ensure you bring your pets in suitable pet carriers. 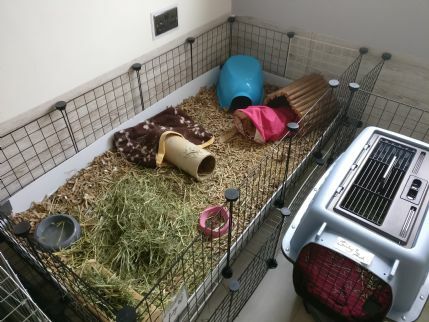 Pens ranging from 6 x 2.5ft to 7 x 4 ft.
We do not use cages for rabbits or guinea pigs unless you bring your own for Guineas, birds or small animals such as hamsters. WE HAVE THE BIGGEST ACCOMMODATION IN THE AREA! Cottages have 24 hour garden access and Outdoor hutches have access to large pens everyday. 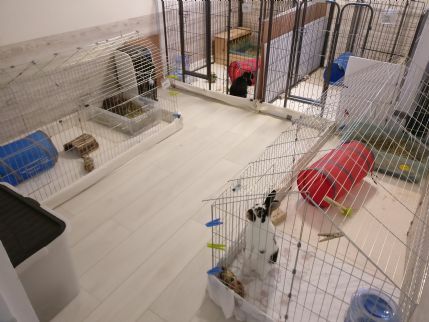 Indoors pens are large enough so that garden time is not needed, though if pens are free outside we do offer indoor guests play time outside in good weather. 1. ALL rabbits must have had the Nobivac Vaccine (myxomatosis/ RVHD1 combi) AND the Filavac Vaccine (RVHD2 vaccine) atleast 2 weeks before the date of their arrival. This is mandatory and non negotiable. Proof via email will be needed upon booking of current, in date vaccinations. 2. Your rabbit MUST be in good health and no pregnant does. We will take rabbits with pre-existing conditions but these must be fully disclosed and discussed at the time of booking. Please disclose any medical conditions, problems or quirks your pet has. Any problems or concerns I have will be relayed to you, for discussion and treatment. All treatments will be at your expense, but this will be discussed upon first noticing a problem. Hamsters and Gerbils are cleans 1-2 times a week. Guinea Pigs are cleaned everyday. 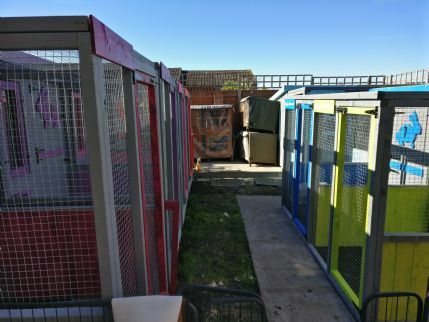 Outdoor hutches and indoor pens: First Pet £7 per night, all subsequent pets £6 per night. Small animals e.g hamsters, gerbils in their own cages: £3.50 per night per animal. Exotics and birds £7 per night per animal. Arrival and Collection time slots are 30mins only. If you fail to show up within this arranged time slot you will have to arrange another time slot when available. We will groom your pet, clip nails if needed and administer any ongoing medication (that has been disclosed) included in the price. Booking Fee are non-refundable as we dont charge for cancellations. see our facebook or website fro more details. Tracey has been looking after my rabbits for the last 3 years. I wouldn't go anywhere else. They are really well looked after and are always trimmed and any knots in their fur removed. Nails are also cut and rumble and sooty love their little holiday. Would recommend anyone with small animals or pets to use Tracey, you won't find anywhere better. Tracy definitely knows her rabbits! We've boarded our rabbits with Tracy multiple times over the past several years and we won't go anywhere else. They are well looked after and are clearly happy there with lovely hay and lots of space to hop and play. We love that we can always check in on them on the cameras. Her home made treats also go down well with our buns who get very excited when their hear us get them out of the bags. Overall, I can highly recommend her services. I cannot recommend Tracy enough! I have been using her for over a year now for our 2 bunnies and the service she provides is outstanding! She is unbelievably knowledgeable, she genuinely cares about our bunnies and she has been so flexible when i have needed her. My bunny got very sick last year and I took him to Tracy. She knew exactly what to do, she nursed him through the night and took him to the vets when he got extremely unwell. Luckily he pulled through but I don't think he would have survived without Tracy's help. Needless to say I would not trust anyone else with my bunnies! We boarded our African Grey parrot with Tracey at Hop-It holidays. She fit us in very last minute when we were let down by another boarder. It was literally an hour as we got to the other boarder and was not happy to leave him there. He was kept in the kitchen which was clean and tidy with a rabbit room mate to watch. We didn't bring many toys with him, but upon return Tracey had bought him toys, bells and treats. We also found he had been having great fun around the kitchen and trying to steal her fruit from the fruit basket. He was let out everyday for hours and we were able to watch him on the camera singing and dancing. We would very happily board him here again. Boarders Response:He was a joy to look after and his noises and dancing were adorable. He even did the birdie song and would wolf whistle all day. A joy to look after even with all the mess and destroyed wooden toys everywhere. We have used Tracey for a few years now and would not go anywhere else. Viola was under the weather and Tracey nursed her as if she were her own bunny. I can't thank Tracey enough. The accommodation is spotless and are really luxurious. Thank you Tracey! Boarders Response:Thank you so much. Its very sad to see Vivi so sick with E.C but i'm glad she is continuing to get better and we hope for a full recovery for her. We were very reluctant to board our rabbit Fluffs anywhere after having a bad experience in the past boarding at another establishment that caused our other rabbit to be put down from neglect. We talked to Tracey and her passion for rabbit welfare and her extensive knowledge shone through. We were able to view the cottages and pens before we booked and spent at least an hour to chat about our past experience and our concerns. She reassured us that Fluffs would be very well taken care of. The cameras are such a good idea we logged in every day to see a clean pen and happy bunny. I think we saw more of her while on holiday in Spain than when we are home. She looked extremely content and we got to watch her be groomed outside via the garden camera, claws clipped and had time out in the garden in one of the cottage pens even though we didn't pay for a cottage space. We are extremely happy to bring Fluffs back time and time again. We bought some of Tracey's homemade bunny biscuits, forage bags and a hay brick too. Tracey really knows her stuff. Can't sing her praises more. We can now go on holiday whenever we want knowing that Fluffs will be looked after. Boarders Response:Thank you so much for the massive review. Fluffs was a lovely bunny to look after. Hop-It holidays looked after my hamster for a few weeks. She was kept super clean and tidy. We where able to watch on the camera everyday while we where away, which was great and gave our little girl the reassurance that she was being cared for and we where able to watch her in the ball every night. Tracey very kindly cleaned and disinfected the exercise ball and disinfected the base of the cage without us even asking to get rid of the build up of mess we couldn't remove. We where delighted at the condition of the house the cleanliness of the rabbits in the kitchen and garden we saw too. Would definitely board again here and recommend Hop-It Holidays to everyone. For Â£3.50 a night its great value for the work Tracey puts in. Boarders Response:Thank you so much for your lovely review. We appreciate the time you took to write such an extensive review. Ms Puddle was a lovely sweet hamster and so friendly. Our rabbits Bobs and Dixie have stayed here numerous times. Tracey and Laurence are very knowledgable and couldn't to more for our rabbits. They are also on hand with advice should it ever be needed day or night. We wouldn't leave our rabbits anywhere else. I cannot recommend Hopitholidays highly enough. Boarded a rabbit and a hamster this time and once again my pets were looked after as if they were their own. Highly recommend! 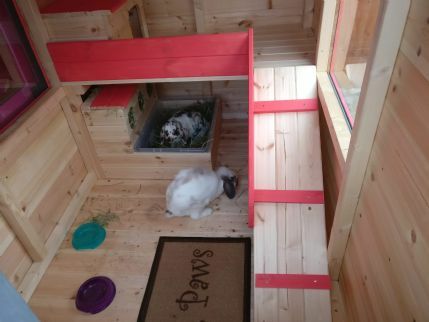 Our little rabbit is always well looked after here, Tracey is clearly a bunny-lover and she knows a great deal about rabbits and other small pets. She is very well organised, everything is clean and under control. She is always happy to explain things to us, show us around, etc. We know that we are leaving out bunny in safe hands. Happy to recommend Hop-It-Holidays! Boarders Response:Thank you so much for you lovely review. Lucky is a very handsome little boy, we love him very much. The response was quick as our request for boarding for my daughter's hamster was at short notice, so thank you for that. Upon arrival I was taken aback by the smell of the house (small animal poo and wee) and the amount of hamster poo on the floor. But no turning back as we had no other options. I made it clear that the cage must be spot cleaned every day, poo removed and wee areas removed and replaced with fresh bedding. She nodded. Upon return 2 days later, my daughter was dismayed to find that no poo had been cleaned out and neither had the tank been spot cleaned for wee. 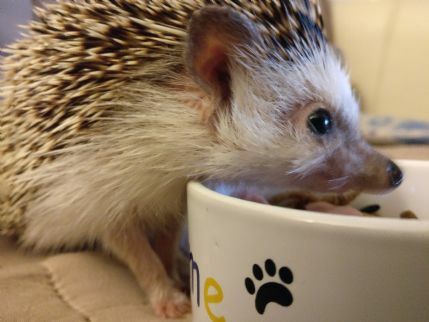 She had merely given food and put Oreo in her wheel once daily. For somebody who claims a luxury boarding facility, this was absolutely disgusting. On top of this, she handed me back Oreo's ball with poo in it. I pointed that out to her and she said, 'oh' and just shook the poo out on the floor. Narsty! My daughter was so disgusted and upset that she had used her pocket money for such sub-standard care. I rang Hop it Holidays later and shared my concerns with her. She apologised for us being disappointed but said that she would only clean out cages once weekly. No wonder her house stank! She should have refunded my daughter 50% at least, but no offer was made. We came home and gave that cage a thorough clean. If you are a pet lover you must keep your pet in clean surroundings, or else you are not caring for your pet. Never again will we use Hop it Holidays, and neither should you! Boarders Response:We are very sorry in this instance that you found our service didn't meet your expectations. We have never had a complaint before about our cleanness or smell of our home in fact quite the opposite. I didn't notice the poo in the ball till I handed it to the owner and this was not dropped on the floor but in a litter tray in a pen that had been vacated not 5 mins before and was going to be cleaned out once the Hamster who was our last guest coming/ going that day was gone. Yes there was a small amount of hamster poop on the floor from another hamster. We sweep and clean the floor multiple times a day. Our usual practice is to clean hamsters once/twice a week, and we wouldn't usually clean a hamster only with us two days. We'll try to be clearer about our policies in future. Really wonderful service. Tracey and Lawrence go all out to keep our furbabies happy and healthy. I am always secure in the knowledge that they are knowledgeable and love rabbits too. Bobbin was well cared for at Hop-It Holidays. Tracey understood his needs perfectly and Bobbin enjoyed lots of playthings. Thanks also for the invaluable Free advice!! It is comforting to know we have found somewhere caring for our pet whilst we are away. Hop-It Holidays really know their rabbits - Stomper took over the kitchen for a week because he didn't like his hutch and I received invaluable nutrition and care advice to get him into peak condition. He is a different rabbit - happy, healthy and looking forward to the speed dating I have lined up for him. Thanks so much! 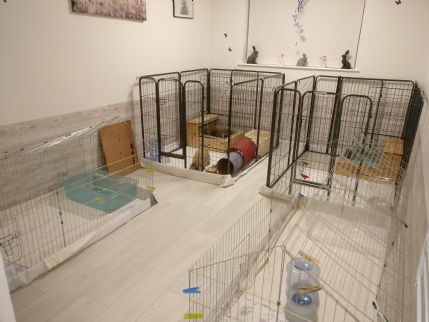 Absolutely brilliant rabbit boarding home. Tracy is so enthusiastic about bunnies you and you know that they are being well cared for and loved as she provides you with regular updates. I would not hesitate to leave my rabbits in her care again, and I don't think they can wait to go back! Daisy had a lovely time at Hop-it holidays. Was well looked after. Would recommend hop-it holidays. Very knowledgeable and Really cares for bunnies. Thanks Tracey, will be booking Daisy in again. 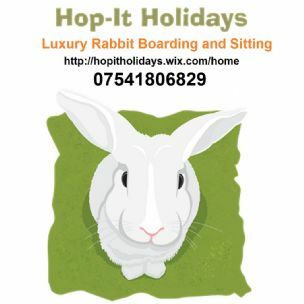 Our rabbit Bernie enjoyed his stay at hop it holidays. Very rabbit friendly and knowledgeable about rabbits hutches were all very clean and really nice to be able to see photos of bernie enjoying himself out of the hutch,while we were away. Have booked again in september. Our bunnies had a great jolly holiday at Hop it and we would recommend it to all. Thankyou Tracey for looking after our boys so well.